The latest update of the International Jobs Report shows that: “The global unemployment rate is expected to remain stable this year at about 5.7 percent and then decline in the coming years. The total number of people unemployed around the globe will remain at about 175 million this year. Unemployment rates are expected to decline in most advanced economies, but expected to be higher this year (compared to last year) in many emerging markets. 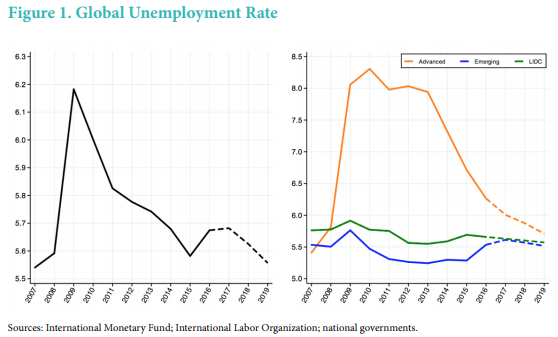 Venezuela’s unemployment rate is expected to increase by 4 percentage points between 2016 and 2017, with smaller increases expected in Algeria, Brazil, South Africa and Turkey.” Continue reading here.